Mark Allen's half-century break in the deciding frame clinched a 4-3 victory over Mark Davis in the first round of the Players Championship in Manchester. 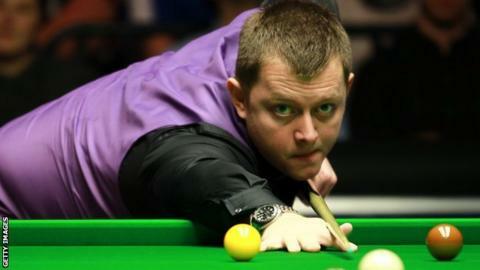 The Antrim man hit a break of 123 in the first frame and came from 3-2 down to set up a last-16 tie with Mark King. Former world champion Mark Williams was beaten 4-3 by fellow Welshman Dominic Dale in a final-frame decider. Barry Hawkins is also through after a 4-2 win over Michael Holt, while Matthew Selt beat Andrew Higginson 4-1. Dale, who now plays another former world champion Shaun Murphy, clinched victory with a break of 61 in the final frame. "I haven't performed in the big arenas this season so a win like this is a big stepping stone for me," he said. Selt replaced Mark Selby in the draw after the world number one withdrew from the event last week and could move into the top 16 if he reaches the final this week. Ryan Day enjoyed a 4-1 win over Kyren Wilson, with Robert Milkins beating Tian Pengfei by the same scoreline. Ricky Walden had breaks of 112, 77, 57 and 80 in beating Tom Ford 4-1.